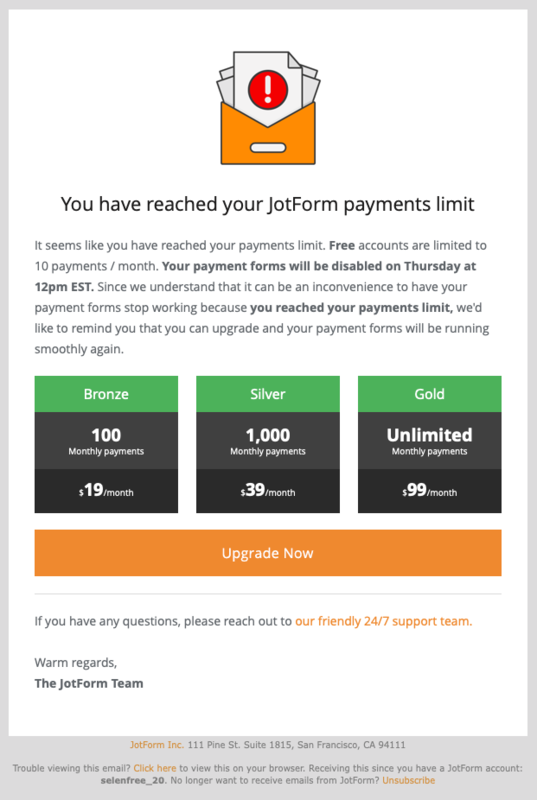 Confused on how your account limits work? Don't worry, in this guide we got you covered. Here, we will help you understand the different limits that your account has based on the subscription or plan that you are into. First, please visit our PRICING PAGE to get a quick breakdown of the limits for each plan. 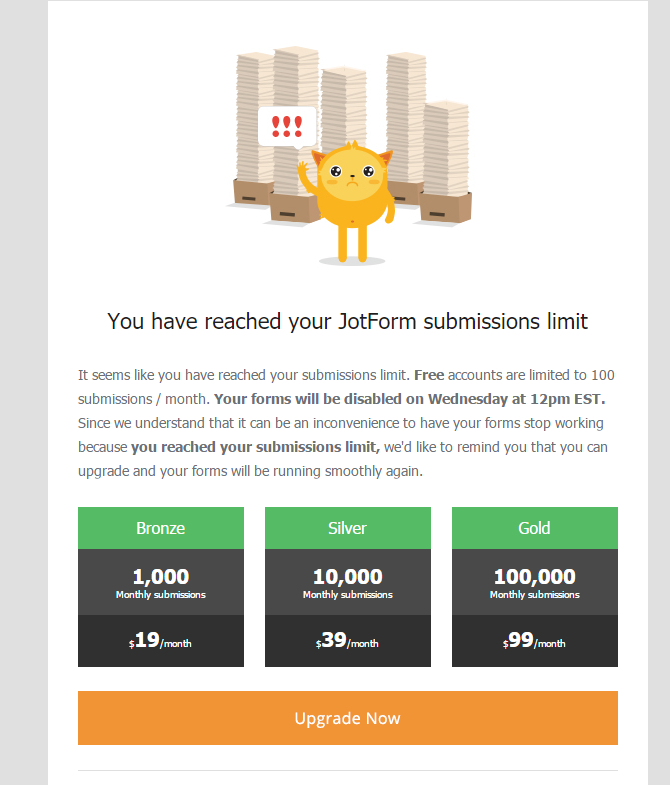 When you login to your JotForm account, you can view your current usage by clicking the AVATAR at the top right corner of the page. 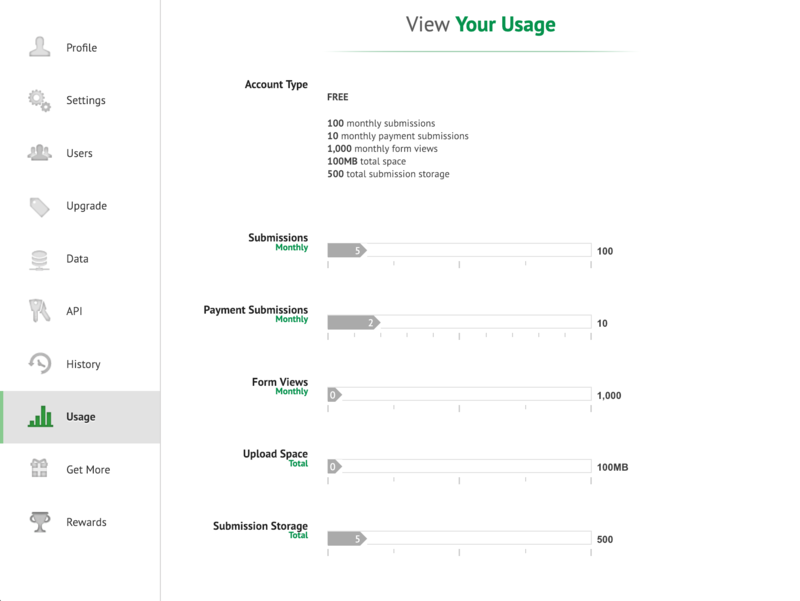 Or, by simply navigating to your ACCOUNT'S USAGE page. 🔘 Submissions Received (monthly): This is the number of submissions you can receive on a monthly basis. The count covers the calendar date which means 1st day to last day of the month. 🔘 Payment Submissions (monthly): This is the number of submissions that have payment integrations on them. You can check this guide on how to create a payment/order form. So for example, we have Paypal payment integration on our form, if a user fills out the form, submitted it and successfully completed the payment, then that would be counted as a payment submission. 🔘 Form Views (monthly): This is the number of times your form can be viewed. We have a separate guide that tackles it more in detail, you can check this link. 🔘 Forms (total): This is the number of forms you can create and that are active. You can enable and disable the forms to allow you to set which ones should be active. 🔘 Upload Space (total): This limit refers to your forms that uses a file upload field. The submissions can have file attachments on them and these files will take up the "Upload Space" limit. Note that this does not reset, this is fixed. If you wish to free up your upload space, you can delete submissions that have file uploads on them, but please do keep in mind that deleting submission data is irreversible and will permanently remove the data in our servers. 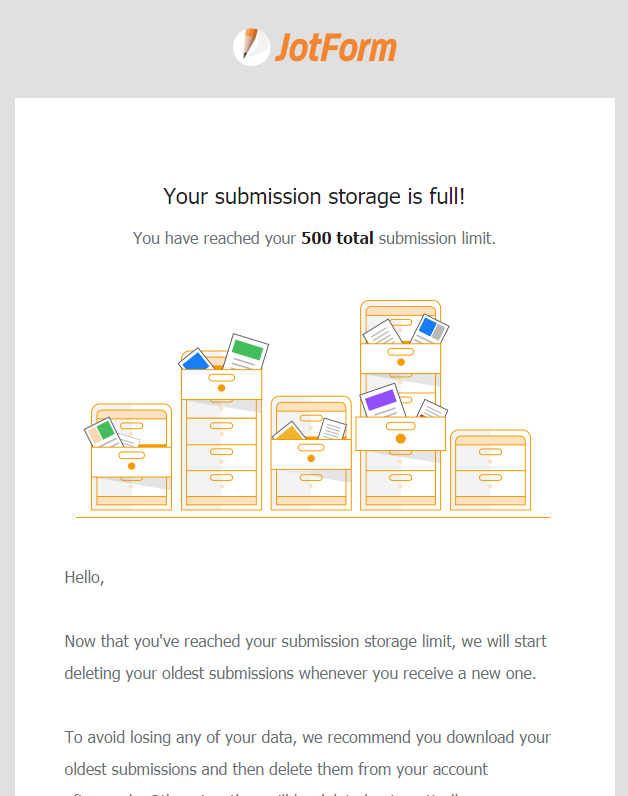 🔘 Submission Storage (total): This is the total number of submissions you can store on your account itself, this is different from the first one which is a monthly limit. So for example, in "Free" plan, you are only allowed to have a total submission storage of 500. These 500 are the most recent submissions that you received. If you exceed your limit, the oldest submission data will be deleted, giving way for the new ones to be received. NOTE: Those "monthly" limits reset on the 1st day of each month. You can always upgrade or downgrade to different plans depending on your current needs. Once you reach any of your limits, you will receive an email informing you about it. 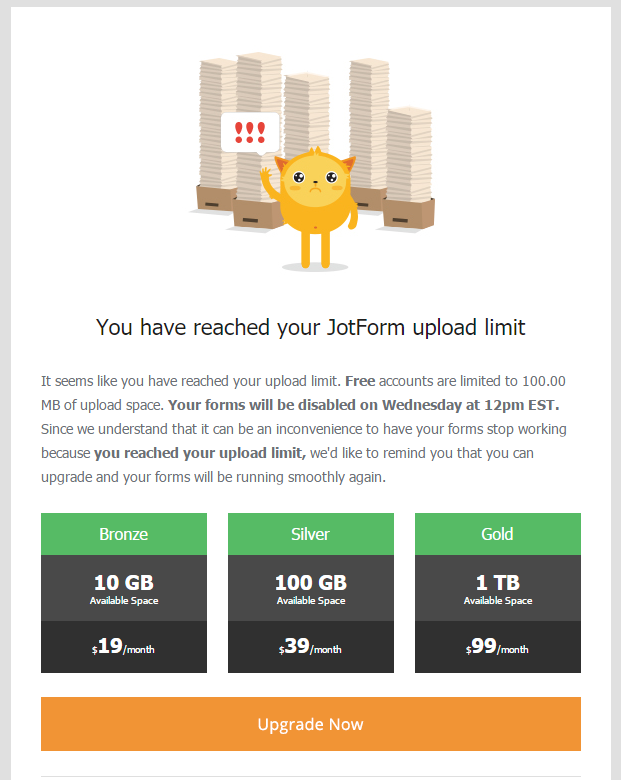 The Upload Space limit and the Submission Storage limits are fixed. They do not reset. You can free up these limits by deleting submission data. The API daily limit resets everyday, but you should also received an email if you reached your limit. Emails will be sent to you informing you about the limits and what steps you can take to resolve it. 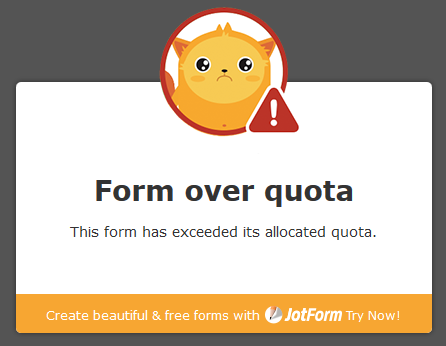 Your forms will also display the message "Form over quota". For the Submission Storage limit, your forms will continue to receive submissions but the old submissions will be deleted to give way for the new ones, this is explained above and on the email that you will receive. For the total number of active "Forms", if you reached the limit, you won't be able to create a new form or make another one active. For the API daily limit, applications, widgets or anything that uses API calls will fail if you reached the limit. NOTE: It is possible that the warning emails might end up in your spam/trash/junk folders, I suggest checking them just in case. It is also best to add noreply@jotform.com and noreply@formresponse.com to your contact list. If you have further questions, feel free to leave a comment below or visit our forum page. I'm planning to upgrade my account to Bronze, but first, i want to know, if i have the Bronze plan and i reach the submissions limit, can i pay for an extension? If is that the case, how much i would have to pay, and how much it will extend the submissions limit? 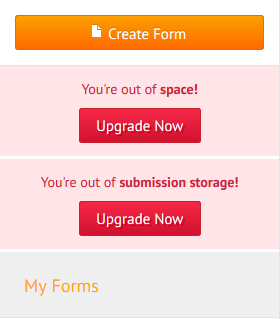 I am within the limits on my free account but I am unable to access my forms. perchè non riesco a visualizzare le persone che si registrano al modulo? cosa devo fare? 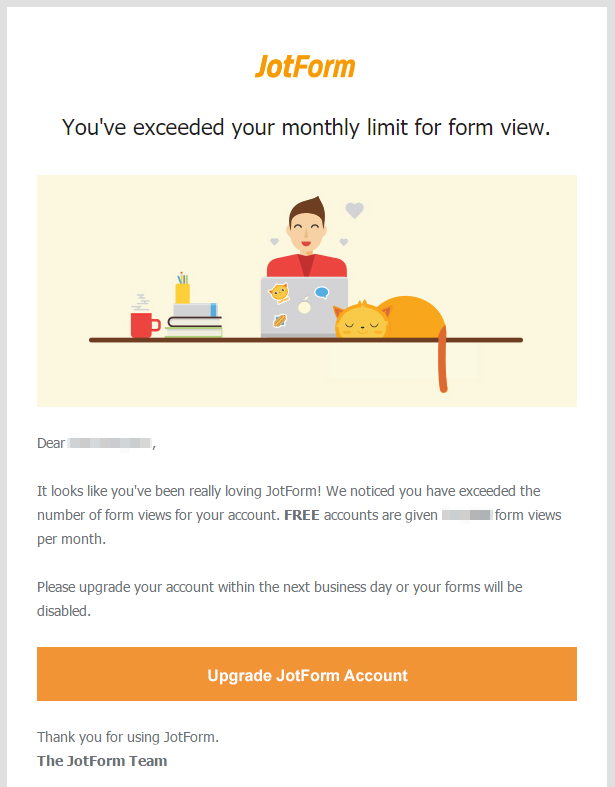 Hi there, if i choose to create a form via jotform, and my paid subscription expires, will the link still be kept active? You're ridiculous. Time to search for another solution. The changes from the previous account limits to the current ones are severe. I love jotform but have started searching for an alternative. Paying an extra $240 a year to process an 25-30 additional forms a year is ridiculous, especially since it's the payment processors that are doing the work. These new limitations are ridiculous. I thought the day would never come, but it is time to search for alternative services. I deleted my submissions to free up space. How long will it take for this to reset? Also, I accidentally archived a form that I need to be made active again. Can you please help me? Thank you. I want to verify that I have understood correctly: This means that for the next month I can receive 100 submission and so every month, ¿is that correct? If I follow you on twitter, they will be 110 monthly and if also in Instagram, they will be 10 more for a total of 120 monthly, ¿is that correct? I’ve maxed out my 10GB of Upload Space Limit. I have deleted over 50% of the files stored there. How do I get my forms working again? Will they re-set automatically? We do not wish to upgrade at this time. Hitting our limit was an accident. We are comfortably working within our current subscription allocations. Our organization is a Car Club, a 501-C7 for taxing purposes. We have a car show once a year the profits of which go to the local Elks club for their Christmas basket program and to individuals and groups in the local community that are in need. ie, we gave a power scooter to a 9 yr old boy, donated to the sheriff's department K-9 program, donated to the high school acohol free grad night, and Kiwanis splash pool for the local children. No one in our organization receives a salary. Are we eligible for a non-profit account? When the 100 MB space limit is reached in the Free account, can space be freed up by downloading the oldest submissions and then deleting them from the account? Around how much space does one form normally take up without photos? I am unable to preview the form I am working on. says that the form is disabled. I do not really understad the form, util now i used to receive notes, and works well, but always apear this note from you. Why I need to change email? 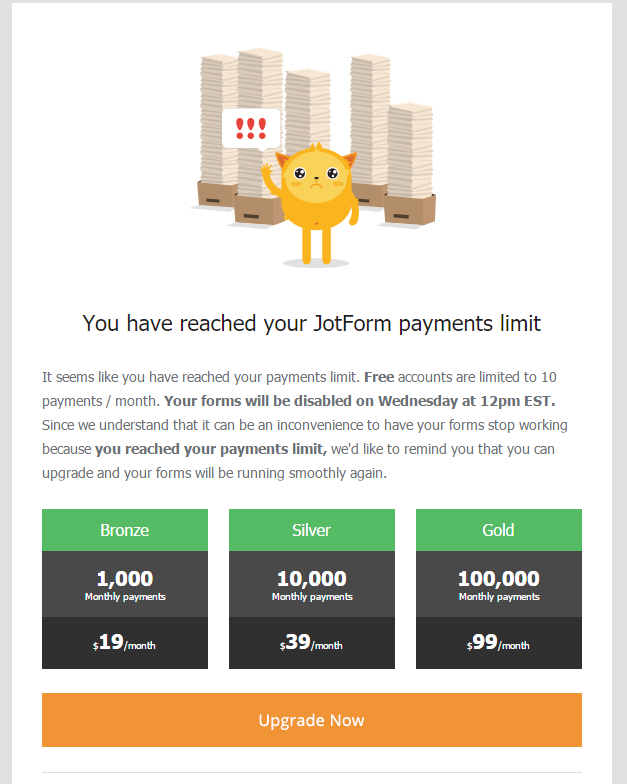 We recently were not able to email you because your email address "guama@jotform.com" is in our bounce list. What happen if I exceed my upload space but I have integrate it with google drive, will my form still work?